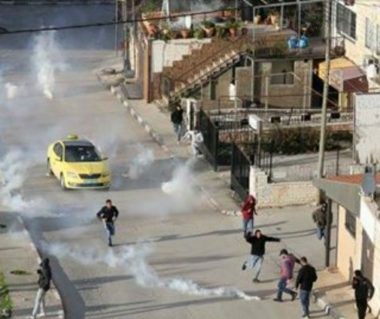 Several children of a kindergarten in the central West Bank city of Ramallah suffered, Thursday, the severe effects of teargas inhalation, after Israeli soldiers invaded the city, and fire gas bombs. The Palestinian Red Crescent Society (PRCS) said the soldiers invaded Ramallah at-Tihta area, and stormed the homes of Zakariya Zobeidi, a member of the Revolutionary Council of Fateh Movement, and Lawyer Tareq Barghouth, who works with the Palestinian Detainees’ Committee, and abducted them. The soldiers then fired many gas bombs and concussion grenades at Palestinian protesters in the area, some striking the kindergarten there, causing many children to suffer the effects of teargas inhalation. The PRCS added that its medics rushed to the kindergarten, and the soldiers tried to stop them, but they insisted on performing their duties and went into the place to provide the children with the needed medical attention.